I originally planned to look at Seattle-Tennessee as my Sunday intriguing matchup in Week 3 as that could be a potential Super Bowl preview (not saying it's going to happen, but it could). Plus, those clubs are a lot alike. However, after watching the New York Football Giants on Monday night and their inept offense against the Detroit Lions, I felt compelled to switch up to Giants-Eagles in Philadelphia's home opener. Bovada posted updated first coach to be fired odds after Week 1; not sure if the site will post them weekly or not. At that point, Indy's Chuck Pagano was the -150 favorite, and I'm positive he would still be the heavy favorite after his team blew a 10-point fourth-quarter lead in its home opener against Arizona on Sunday to fall to 0-2. The Giants' Ben McAdoo was +1200 then. Now I'd put him second on the chopping block behind Pagano -- there could be openings for both New York teams this offseason because you know Todd Bowles won't be back with the Jets. When the Giants pushed two-time Super Bowl-winning coach Tom Coughlin out the door following the 2015 season, they did so in part to ensure that they would be able to keep McAdoo, who was the team's offensive coordinator. That season, New York ranked eighth in total offense and put up 26.3 points per game (sixth). Eli Manning set career highs with 4,436 yards, 35 touchdowns and a rating of 93.6. However, that offense has gone completely downhill since. The only reason New York won 11 games last year and made the playoffs was because of one of the NFL's best defenses. The offense ranked 25th in yards and averaged 19.4 points (26th). Manning's yardage slipped to 4,027, his TDs to 26 and his rating to 86.0. In Week 1 this year, the Giants lost 19-3 in Dallas -- team New York beat twice in 2016. Big Blue had just 233 yards (35 rushing) and 13 first downs. Manning threw a pick and was sacked three times. On Monday in the home opener against a Lions team the Giants beat late last season, Detroit pulled off a 24-10 upset. Staggeringly, it was the eighth straight game that New York was held to fewer than 20 points. The G-Men got Odell Beckham back from his ankle injury, but he was a non-factor with four catches for 36 yards. New York had 270 yards (62 rushing) and 14 first downs. Manning threw a pick and was sacked five times. He also made a big mistake with about five minutes left and the Giants down 10 and fourth-and-goal at the Lions' 2. They were going to try for the TD, but Manning never got the play off. Delay of game and field goal try. "Sloppy quarterback play," McAdoo said. "Quarterback and center need to be on the same page there. We need to get the ball snapped." Throwing your franchise QB under the bus isn't a good way to stay employed -- although he's right. Do I think Manning is shot? He's definitely not what he was, but this is far from 100 percent his fault. New York's offensive line wasn't good last year, and the team brought everyone back. It was dominated by the Lions on Monday; left tackle Ereck Flowers simply is not a good player. Ezekiel Ansah (three sacks) ate his lunch all night. Because the O-Line stinks, the Giants can't run the ball. Thus Manning is often in third-and-long, and that's not good for any quarterback. The Giants have scored 13 points in their eight quarters; they haven't scored fewer in their first two games since 1947. Much of this has to go on McAdoo, though, considering he calls the plays. The Giants' job would be coveted this offseason as it's a well-run organization for the most part (unlike the Jets) and there's the whole New York factor. Let's not forget about the Eagles (1-1), the only team with a positive point differential in the NFC East and who have scored 37 more points than the Giants. Philadelphia won easily in Washington in Week 1 and then lost 27-20 in Week 2 in Kansas City, but that's completely acceptable and it was very encouraging to see Philly keep fighting back against perhaps the AFC's best team (so far). While there are questions about Manning's future, the Eagles look set at quarterback for at least a decade as second-year Carson Wentz is fourth in the NFL with 640 passing yards and has thrown two TD passes in each game. He's young so he still tends to make a bad throw or two per game (two picks) and hold onto the ball too long (eight sacks), but he's a franchise player. The Eagles got Wentz a few new receiving toys in free agency this offseason, and Alshon Jeffery caught seven passes for 92 yards and a TD against Kansas City. That Philly offense has one similar glaring issue that the Giants do: running the ball. LeGarrette Blount was brought in to be the featured back but has 46 yards on 14 carries. Wendell Smallwood has 8 yards on seven carries. The only reason the Eagles are 18th in rushing yards instead of about 30th is Wentz (61 yards on eight carries) and scatback Darren Sproles (50 yards on 12). This team will target a running back early in the 2018 draft (or Le'Veon Bell in free agency?). Because the running game is struggling, Wentz is throwing too much (85 attempts). At 5Dimes , Philadelphia is a 6-point favorite with a total of 43.5. On the moneyline, the Eagles are -265 and Giants +225. No alternate lines as of this writing, but you can pretty much assume what they will be. New York is 0-2 against the spread (0-1 on road) and 0-2 "over/under" (0-1 on road). Philadelphia is 1-1 ATS (first home game) and 1-1 O/U. The Giants are 1-4 ATS in their past five road games. 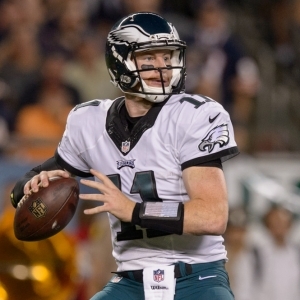 The Eagles are 5-1 ATS in their past six in September and 6-2 ATS in their previous eight at home. The under is 9-2 in the Giants' past 11. It is 6-2 in the Eagles' previous eight at home. The Giants are 1-5 ATS in the past six meetings. The under is 6-1 in the previous seven in Philadelphia. These teams split last year, each winning at home. I already loved the under here, but even more so now that the Giants think they will have Pro Bowl cornerback Janoris Jenkins and starting middle linebacker B.J. Goodson back after both missed Monday's game due to injury. New York's defense played great even without them vs. Detroit. The Eagles' defense was night-and-day better at home last year than on the road. This should end something like 20-13. On the side, go with Philadelphia.